Best Western Hotels & Resorts has joined hands with the Habitat Group, a leading Thai development company, to celebrate the start of construction work on Thailand’s first BW Premier Collection by Best Western resort. BluPhere Pattaya, BW Premier Collection by Best Western is an eight-storey project in Na Jomtien, a stunning beachfront destination on Thailand’s popular Eastern Seaboard. Scheduled to welcome its first guests in 2020, the hotel has already attracted considerable attention and praise, having won three honours at the Thailand Property Awards 2017, including “Best Low-Rise Condo Architectural Design (Resort)”. The groundbreaking ceremony was held on March 19 and was attended by Olivier Berrivin, Best Western’s managing director of International Operations – Asia, and Rodney Simpson, senior regional director of operations – Asia. They were joined by Habitat Group’s CEO, Chanin Vanijwongse and chief operating officer, Sasivimol Sutthibut. “We are delighted to come together with our friends at the Habitat Group as we celebrate the start of construction on one of our most exciting hotels for many years: BluPhere Pattaya, BW Premier Collection by Best Western” Olivier commented. “Habitat Group has a proven track record of creating striking, stylish properties that perfectly complement their natural environment. With its stunning seafront setting, innovative design and upscale facilities, BluPhere Pattaya will become the new Asian flagship hotel in our upscale BW Premier Collection by Best Western,” he added. 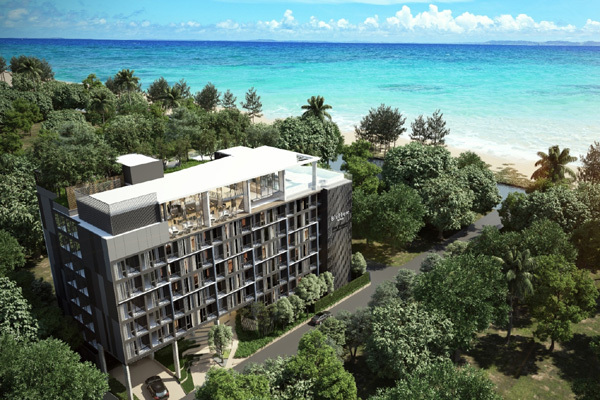 Located just 100 meters from the beach, a few minutes from downtown Pattaya and just over a two-hour drive from Bangkok, BluPhere Pattaya, BW Premier Collection by Best Western will feature 199 spacious apartment-style units, plus a range of high-end facilities and complimentary wi-fi. It will be easily accessible from Bangkok’s Suvarnabhumi Airport and the fast-expanding U-Tapao Airport, which serves Thailand’s Eastern Seaboard, making the hotel ideal for all kinds of beachfront break, including weekend escapes from the city and longer vacations. This signing marks the latest collaboration between Best Western and Habitat Group, following the Best Western Premier BayPhere Pattaya - another upscale development on this exquisite stretch of golden coastline, overlooking the turquoise waters of the Gulf of Thailand, which is scheduled to open in 2019.